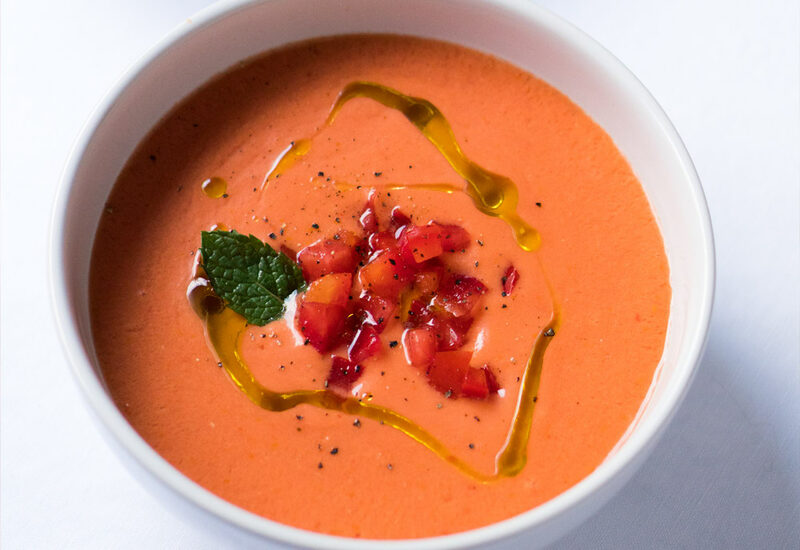 Gazpacho, a chilled vegetable soup from southern Spain, is the best thing to make for hot, lazy summer days. The savory mixture requires no cooking, meaning it's perfect for those nights when it's still 90° at 8:00 pm. This healthy recipe blends fresh tomatoes, red bell pepper, cucumber and onion with olive oil and a hit of acidic sherry vinegar—and all it requires is a blender. Serve the soup in bowls, drizzled with a little good-quality olive oil. Alternatively, portion the gazpacho into shot glasses for a sophisticated yet simple appetizer for your next cocktail party. Add some protein to this refreshing soup by stirring in some cooked, chopped shrimp. The gazpacho is even better when made ahead of time, since the flavors will mellow and blend as they sit. Make up to two days before you plan to serve it and refrigerate. Per Serving: 191 calories; 14g fat; 13.6g carbohydrates; 3g protein; 0mg cholesterol; 92mg sodium. Classic gazpacho recipe! I took the advice listed above and added chopped shrimp, it was amazing. It's perfect for a sunny, warm afternoon. Very delicious and authentic tasting Spanish gazpacho. The color is incredible and the tomato flavors are amazing. One of my favorite chilled soup recipes, perfectly for warm days and beach weather.